Last week I received the Cherry Blossom wall decal in brown and the Zebra wall decal in black from Dezign with a Z, an online company that sells decorative home and office wall decals. Both of the decals I got were the smallest size (the Zebra is 22x23 in. ), but you could order them larger too (up to 47x48 in. 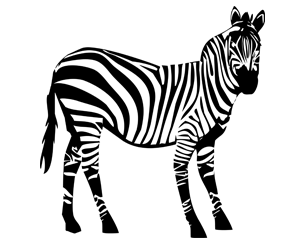 for the Zebra) if you wanted to fill up more wall space. I'm glad I got the smaller ones though, as I'm not quite sure I'd want a life-size zebra on my wall! These decals are removable, which is nice because you don't have to worry about ruining your walls. They are pretty simple to apply and just take some time to smooth down, but it's pretty effortless and much easier than painting! 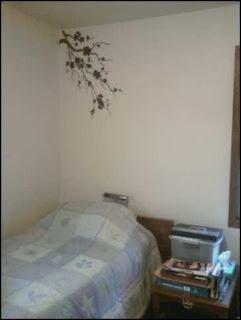 I put up the Cherry Blossom wall decal in my guest bedroom and I like how it turned out. It adds some fun whimsy to the room. The only thing I had a problem with was some of the tiny branches didn't want to stick, and I ended up just leaving one off that fell down because the decal looks fine without it anyway. I'm not sure why it didn't stick well, but I think it's partly because the branches were so small that they just didn't have as much staying power as bigger sections. I haven't yet put up the zebra because I'm not sure where to put it, but will update this review when I put it up to let you all know if it sticks better than the Cherry Blossom decal. I have a feeling it will since the lines are all pretty thick. I wish I had a children's room to put the zebra in, but alas, I don't. I was thinking it would look cool in the bathroom or porch, but I need some ideas -- Where would you put a 22x23 inch zebra wall decal? What I like about Dezign with a Z is that they not only have a huge selection of designs, but also lots of fun and creative things that other decal companies don't have - like glow in the dark decals and writeable chalkboard decals. Remember those glow in the dark plastic stars we would glue to our ceilings as kids (maybe it was just me...)? Well the glow in the dark decals remind me of that, except these stay on the walls and there are more shapes than just stars! I love the Monsters in the Dark decals, those look so fun for a little boys bedroom! There are also wall clock decals and just about everything you can imagine. Check out Dezign with a Z and give your home a creative touch! Thanks Dezign with a Z! Disclaimer: I was given Dezign with a Z wall decals free of charge for the purpose of this review. All opinions are my own experiences with the product. Individual results may vary. No other compensation was given. No giveaway on this one, but there is a giveaway on the Dali Decals post which ends this Friday so you should sign up for it! They don't have as many designs, more words and quotes, but they do have some branch and floral decals!